DESCRIPTION A substantial family house that has been extended on both the ground and first floor with a very good sized plot giving substantial parking to the front and a superb rear garden having an approximate length of 130 ft. The property has a living room with working fireplace which leads through to a magnificent full width and extended kitchen/dining/family room which gives direct access onto the rear garden. There is also a downstairs utility room/w.c. 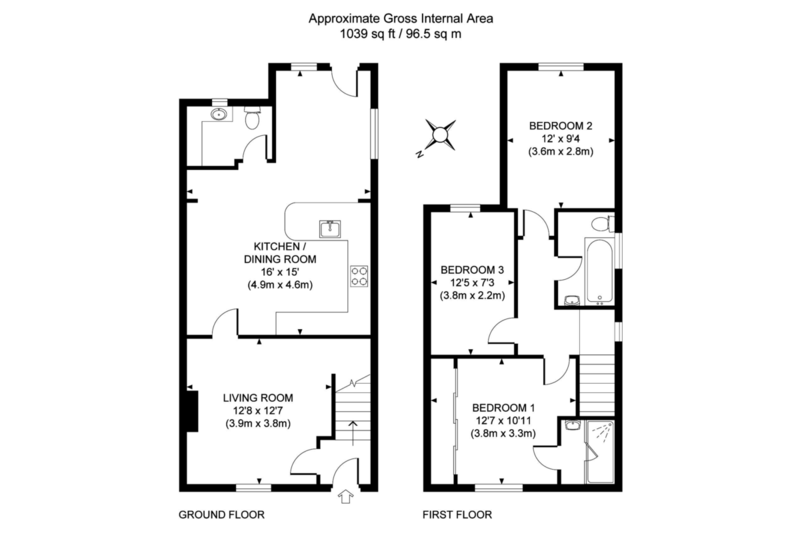 On the first floor are three double bedrooms with the master bedroom having an en-suite. There is also a family bathroom. KITCHEN/ FAMILY ROOM Being a magnificent room running the full width of the property and having been extended to the rear to form a real hub of the home. Extensively fitted kitchen with inset five ring gas hob with extractor unit over and having base cupboards and drawers under, space for dishwasher, numerous eye-level units, peninsula worksurface with inset circular bowl sink and drainer with mixer tap having base cupboard under, fitted breakfast bar, cooker unit with integrated double oven with storage above and below, space for large fridge/freezer, radiator. Towards the rear of this room is a double aspect extension which is currently used as a study area with fitted desk, radiator and door to the outside. UTILITY/ CLOAKROOM Comprising: worksurface with space and plumbing for washing machine and tumble dryer beneath, enamel sink with mixer tap having base cupboards under, eye-level unit, gas fired boiler, w.c., double glazed window, radiator. LANDING Double glazed window, radiator, access to roof space. EN-SUITE SHOWER Tiled double shower cubicle with mixer shower, wash hand basin, extractor fan. BEDROOM TWO Radiator, double glazed window. BEDROOM THREE A good sized double room with radiator, double glazed window. FAMILY BATHROOM White suite comprising: panelled bath with mixer tap and hand held shower attachment, pedestal wash hand basin, w.c., tiled floor, chrome heated towel rail, double glazed window, recessed spot lights. PARKING FOR NUMEROUS VEHICLES The front boundary has been laid with tarmac providing off the road parking for several vehicles. This leads to a brick paved drive running towards the front of the property and along the side providing additional parking for numerous vehicles. FRONT GARDEN The front garden has been landscaped with a picket fence towards the front and interspersed flowers and shrubs. REAR GARDEN Being a tremendous feature of the property having an approximate length of 130 ft and consisting of a full width terrace immediately adjacent the property which passes several substantial timber stores. The garden then continues along with a winding path and a substantial area of lawn to one side with well stocked flower and shrub beds. Towards the rear is a close boarded timber garden fence which provides screening as the rear portion of the garden is currently used as a storage area. This area could be utiilised as a childrens' play area or vegetable garden.